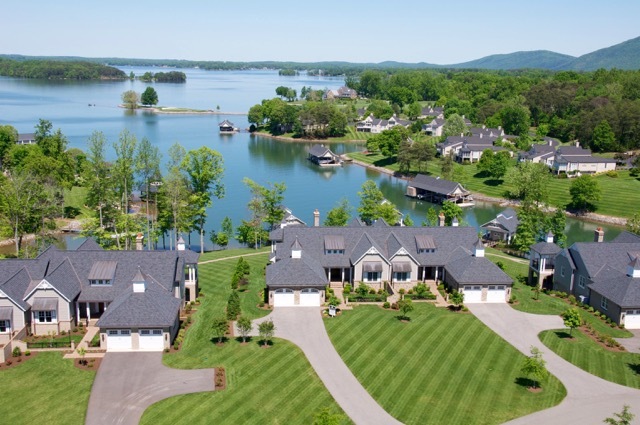 A great selection of luxury condominiums is available in the Smith Mountain Lake area. Most are within walking distance of trails, fishing docks, water ski rentals, and a variety of shops and restaurants. Residents enjoy breathtaking panoramic views of the lake, acres and acres of open spaces, and amenities such as jetted tubs, heated pools, fitness centers, outdoor patios, and so much more. Bridgewater Pointe residents can look forward to spending their days surrounded by the natural beauty of Smith Mountain Lake, while enjoying topnotch features such as secure parking, an outdoor pool, boardwalks, and lakeside docks. The adjacent Bridgewater Plaza also serves as a great entertainment venue with shops, restaurants, an arcade, a mini-golf course atop the marina, and live music. This 48-unit condominium community at The Waterfront is an ideal choice for boating enthusiasts. Each of the two-bedroom and two-bathroom homes here has its own covered boat slip (with hoist) and all feature gorgeous lake and mountain views. Each building is home to 12 condos, with just 4 homes on every floor. Enjoy access to the country club’s 18-hole championship golf course, the clubhouse, and more. A townhouse-style condo community at The Water’s Edge, Grande Villas offers just six two-level townhomes that boast lake and golf course views. These EarthCraft homes are all Energy Star certified and have a shared dock, with each townhome having its own floating dock and covered slip as well as storage and private deck. At Bernard’s Landing, you’ll be living in the heart of a luxury waterfront resort right on Smith Mountain Lake. The resort has its own private beach, three pools, half a dozen tennis courts, a fitness center, and basketball, beach volleyball and racquetball courts, among many other amenities. Extending across an area of over 1,000 acres, the resort community of Mariners Landing offers luxurious, maintenance-free condos nestled in a spectacularly beautiful natural setting. Boasting an 18-hole golf course and direct lake access, the community’s other features include beaches, swimming pools, fishing piers and a boat launch as well as a fitness center, tennis courts, restaurants, and more.